The Battle of the Atom cross-over is in full swing, and X-Men #5 represents the first issue not written by Brian Michael Bendis. One of the dangers of having multiple writers on an event like this is a lack of consistency in the way the characters are written throughout. Brian Wood is a great, smart writer who has been turning in good X-Men stories for a while now (first in the Ultimate Universe, and recently on this title, in both the end of its last volume and since this volume launched). He’s an incredibly competent and occasionally stellar X-writer in his own right, but he’s not Brian Michael Bendis, and in the issue’s early scenes, that shows. Wood has been working with a fairly discrete number of X-Men within his run, and suddenly expanding his range as wide as this issue does surely threw him off a bit. 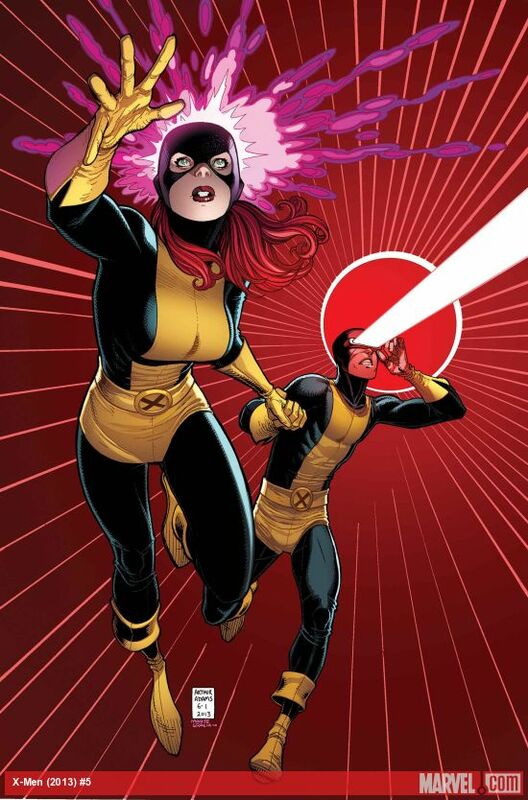 There’s a lot of Bendis-lite banter to the early scenes, as the X-Men, present and future, gear up to chase the escaped Jean Grey and Cyclops of the past, but most of it falls flat. None of the characters feel distinct enough to register as themselves instead of just punchline machines, and it is more than a little distracting. Done well, this type of banter feels like a natural part of the lives of heroes who are in constant mortal danger. Done poorly, it undercuts the stakes that the event is trying to build and makes it harder to take things seriously. It is worth emphasizing that Wood has had a lot thrust at him here. It is not clear how large a hand he, as the least senior X-writer, had in the planning of this event, and regardless it is not too likely that he got to decide which plot points would occur in his issue. He’s a cog in a machine for the moment, moving the pieces around the board and hoping to entertain us while doing so. The issue’s best scene involves Kitty Pryde and Rachel Grey discussing their present situation while eating left-over Chinese food. Both women feel like themselves, the conversation feels realistic to them and to the situation, and there is room for humor and personality in a way there just isn’t when two X-Jets are chasing down Scott and Jean on the Pacific Coast Highway. A lot of what happens here is good, too. The event is at the point where things are picking up and the bigger picture is starting to become clear, but more than that the issue leaves space for great character interactions between the multiple timeline versions of Beast and Iceman, among other cool moments. Because it has less narrative weight to shoulder, X-Men #5 is also less muddled than the event’s first issue. It’s an immediately more engaging story if only because it has the room to be a story instead of a series of character introductions and exposition. It is easy to get caught up in an X-event as an X-Men fan, and while Battle of the Atom isn’t knocking my socks off yet, there’s a lot here that I do quite like, and the potential this will take the X-books in interesting directions going forward. David Lopez’ art is beautiful, but not without its flaws. Lopez does beautiful foreground work, but his backgrounds often seem like an after-thought, with characters lacking faces or losing the detail and dimensions they have when he focuses on them. Lopez is great at conveying emotions in a close-up shot and at laying out panels to keep things dynamic, but his tendency to leave background figures unfinished is incredibly distracting. Try reading the issue without noticing every time someone fifteen feet back is completely missing a face. Unless there are a lot of no-face mutants doubling for our heroes that everybody forgot to mention, this is a problem that takes away from the otherwise solid art. Comics are a serialized medium, with stories rarely wrapped up within a single issue. Each individual issue is a part of a larger puzzle, and some have to bear the brunt of piece-moving and exposition for future issues. Wood has a lot of that to contend with here, including a cliff-hanger that disappointingly recreates the last two issues’ “and then somebody shows up!” twists, but he doesn’t really transcend the basic requirements laid out before him. When he’s driving the book, Wood infuses even less essential issues with life and with an easy sense of comedic timing and weight. But forced into Bendis’ narrative mid-stream, Wood gets lost, and most of what makes X-Men a special book is thrown out the window. There are always losers when an event derails current books. So far, X-Men is the biggest casualty of Battle of the Atom.